The Intermec EasyCoder PF2i printer is specially designed to provide rigorous bar code label printing in areas where space is limited. Users can enjoy all the features and benefits of larger bar code label printers, including stand alone smart printing, without giving up valuable space. 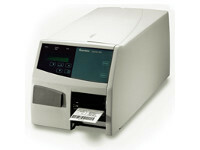 The Intermec EasyCoder PF2i acts as a “smart client” executing user-defined programs. This means the printer eliminates the PC, operates additional hardware (e.g. scanners, other printers, conveyors), accesses information from the network, and retains the ability to change as needed with the application for additional functionality. 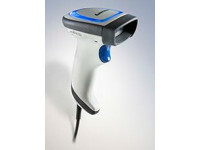 Using Fingerprint, the Intermec EasyCoder PF2i easily adapts to changing host environments and applications. This printer grows with your business and is not restricted by manufacturer printer command languages. There are five interface options for the Intermec EasyCoder PF2i including network and wireless options. When using the EasyLAN Wireless option, any attached peripheral devices also become part of the wireless infrastructure enabling direct access for additional equipment to the network without adding costs. The wireless interface uses an integrated standard 802.11b/g radio providing 128-bit WEP encryption of the information relayed through the network. 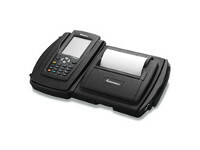 Intermec’s wired and wireless technology ensures secure printing and network infrastructure for all environments. Each printer ships standard with a CompactFlash memory slot. The handy, inexpensive and PC-compatible CompactFlash™ memory technology provides quick and easy memory expansion for extra storage of formats, graphics, fonts and easy firmware upgrades. The Intermec EasyCoder PF2i is designed to excel in demanding applications, printing labels up to 60 mm (2.3 in) wide with features designed to minimize handling. 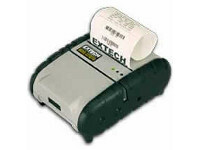 This printer maximizes label printing by using a full size label roll up to 213 mm (8.4 in) to reduce media changes. The magnetic QuickMount™ printhead eliminates hassles and downtime. The printhead is replaced quickly and easily with the magnet and u-brackets ensuring proper alignment – no tools required. The Intermec EasyCoder PF2i bar code printer is exceptionally fast in throughput and printing, reliable, and delivers very high print quality. For applications where space is limited the Intermec EasyCoder PF2i printer exceeds expectations. Up to 76 labels per minute. 101x152mm (4×6 in) GM1724 label. 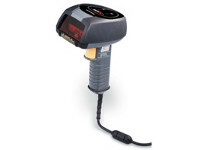 To learn more about print speed, please visit www.intermec.com/printspeed. Prints smooth text, any size bar codes and graphics in all four orthogonal directions. Fingerprint/DP: 15 TrueDoc™ scalable fonts including12 UNICODE (1 WGL4), 1 symbol, 1 OCR-A, 1 OCR-B. Font cache for maximum performance. ATF font support. Non-Latin fonts available as options. IPL firmware: 13 TrueDoc (scalable) fonts + 20 bitmap fonts.